Pass through Barcelona’s main plaza while heading between shopping districts and notice how the old city meets the new. Ideally situation in the cathedral square. 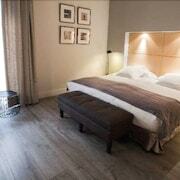 Comfortable room with lovely en suite. Roof terrace. Staff helpful and attentive. 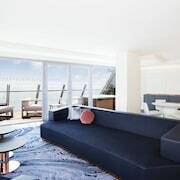 History buffs will enjoy exploring Barcelona, and visitors give high marks for the interesting architecture, renowned art, and fascinating museums. Tourists who journey to this vibrant city can discover its monuments, cathedral, and shopping. Top sights in the city include Palau de la Musica Catalana, Casa Batllo, and Sagrada Familia. Known for its art, museums, and theaters, the city's cultural venues include Palau de la Musica Catalana, Sagrada Familia, and Gran Teatre del Liceu. Notable for its monuments, cathedral, and historic sites, the city's landmarks include Casa Batllo, Montserrat Monastery, and Palau Guell. The city's natural beauty is on display at Montjuic, Barceloneta Beach, and Mar Bella Beach. 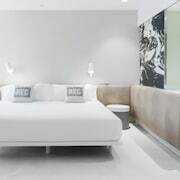 Almanac Barcelona - This 5-star hotel in Dreta de l'Eixample features free breakfast, a restaurant, and an outdoor pool. 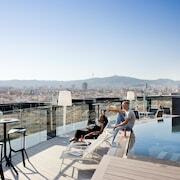 DestinationBCN Apartment Suites - Our customers like the location at this apartment. Guests who stay at this 3.5-star apartment in Dreta de l'Eixample can enjoy access to concierge services and an in-room kitchen. 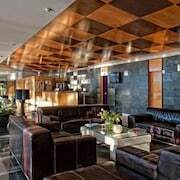 H10 Casa Mimosa - Guests who stay at this 4.5-star hotel in Dreta de l'Eixample can enjoy access to 2 outdoor pools and a restaurant, along with free WiFi. Expedia customers like its breakfast and proximity to shopping. Other favorite sights in Barcelona include Las Ramblas, Barcelona Cathedral, and Placa de Catalunya. With so many choices for transportation, seeing Barcelona is a breeze. You can access metro transit at Parc de Montjuic Station, Paral-lel Station, and Liceu Station. If you want to journey outside of the city, ride aboard a train from Barcelona Placa de Catalunya Station, Plaça de Catalunya Station, or Barcelona Paseo de Gracia Station. 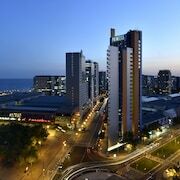 Explore Barcelona with Expedia.com.au’s Travel Guides to find the best flights, cars, holiday packages and more!